Dargle days are just lovely at the moment. Grasslands are golden, bees are humming around the blossoms of Halleria lucida and the sweet fragrance of Buddleja accompanies afternooon walks. Last Friday morning we heard the cry of two fish eagles, and then on Monday as we were riding across the dam wall, there was an adult fish eagle perched on a dead tree on the edge of the dam….obviously feasting on our brown trout!! Seen: Buff-spotted Flufftails, Olive Thrush, Sparrows, Long-crested Eagle, Southern Boubou, Fork-tailed Drongo, Fiscal Shrike, Mousebirds, Doves, Rock Pigeons, bats, hadedahs. Crows chasing two Egyptian Geese away from their nest. Natal Green snakes – two juveniles, Red-lipped Herald, skinks. Gaudy Commodore Butterflies, Carpenter Bees. 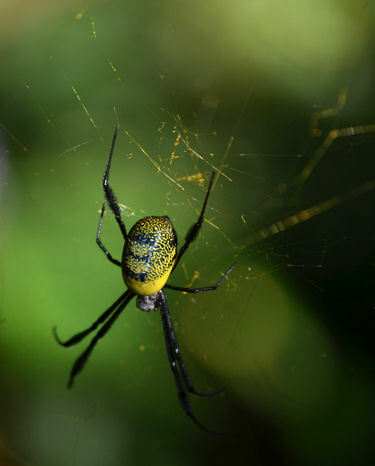 Golden Orb Web spider female (Nephila Fenestra) – pic below Heard: Jackals. Found one dead giant grey mongoose up at the dam. I think the dogs killed it, as they were bitten badly a few months ago. A ground squirrel in the wattle plantation. Saw 3 sets of crane on neighbouring farm in the mist. 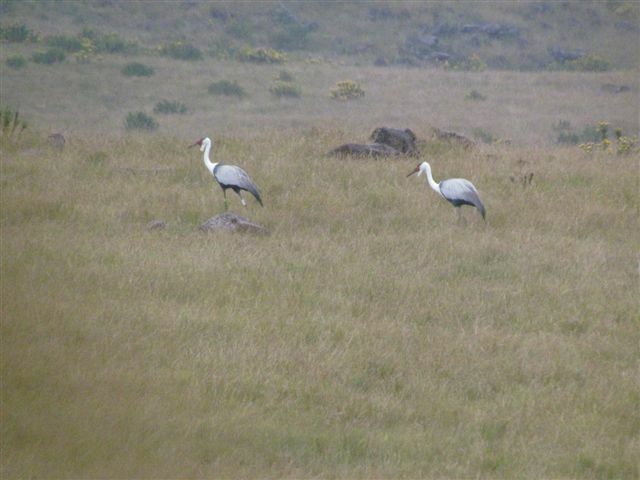 Our 3 blue crane, 3 crowned crane and a pair of wattle crane. Another day, Pat saw 5 wattle crane and it seemed there was a youngster amongst them as much shorter. A pair of wattle crane still arrive at the dam every few days in the early morning to have a bath and grooming session. The fish eagle flies over the farm now and then with its distinctive cry. Seen francolin with a couple of babies. One evening we saw a solitary striped pole cat on the D18 near the house. Never seen one here before. Also 2 hares, a large one and a baby. 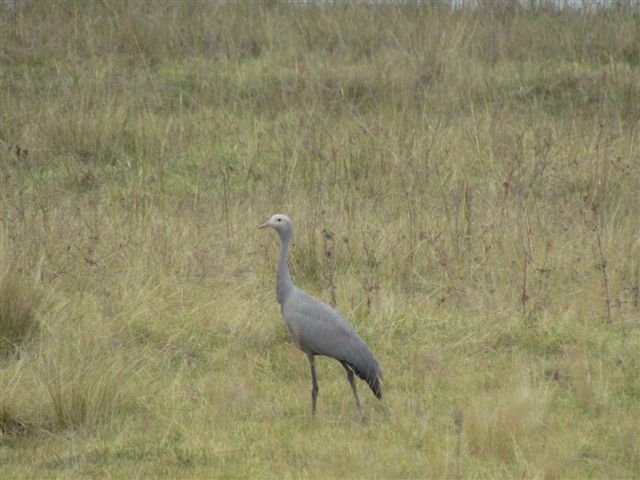 Our blue crane youngster (4 months old) is now flying and the family spread their time between our farm and the neighbours. Don’t see them as regularly as we used to. We have dozens of buffstreaked and common chats flying around the rocks during the day now. 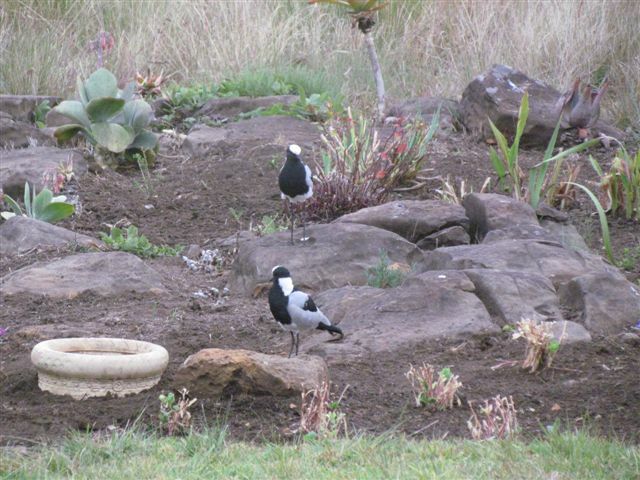 A pair of blacksmith plover feed around our garden several times a day, pulling earth worms out the lawn! They have become fairly tame. With regard to Kevin Barnsley’s story last month on the leopard sightings (I presume it was Kevin as he mentioned pub stories!) A number of years ago, when game guards were still around checking boundary fences for snares, a guard arrived one hot day at the dairy and asked Pat for some water. He said he had just seen a female leopard and 2 cubs, as he walked through the indigenous bush behind Lythwood Lodge. Last year when Pat, I and the dogs were walking on a trail through the same bush, we heard that special noise that only leopard make. Our dogs were ahead of us and came running back with hair standing up. Needless to say, we turned tail and scuttled back the way we had come. A few years ago Ron Richardson (ex owner Endebeni Farm) said he saw a leopard early in the morning walking near the river towards the same bush. One evening recently, monkeys and reedbuck were making a huge racket in the patches of forest and grassland across the river. It was a different noise than usual and I think the fuss was very likely caused by a large predator. Leopard? 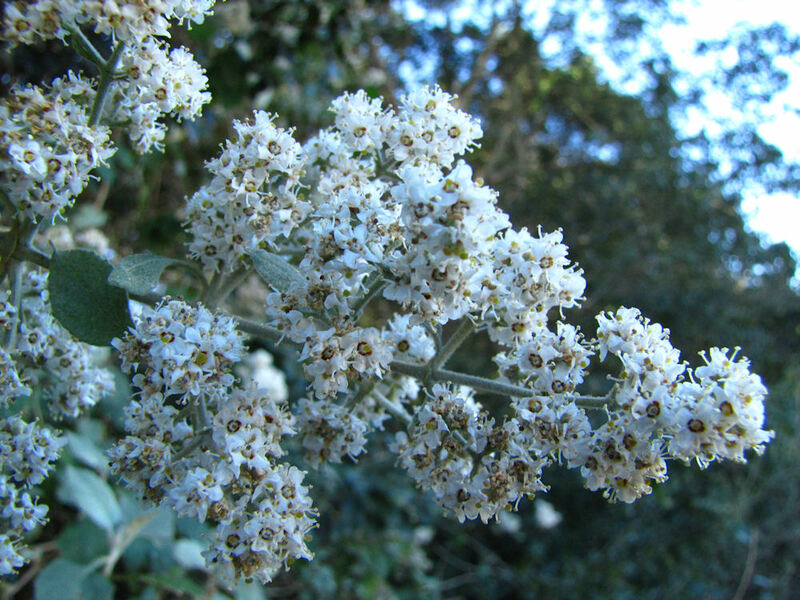 Plants: Buddleja auriculata (pic below), Buddleja salvifolia, Senecio tamoides, Phymaspermum acerosum, Leonotis leonaurus, Halleria lucida, Gnidia splendens. Birds: 3 African Spoonbills flying over, fish eagle, 15 Cape Parrots, Cape Batis, Thick billed Weavers, Bush black cap, Amethyst sunbirds (and others), Golden Oriel, Francolins, Jackal Buzzard, Chorister Robin, Cape Robin Chat, Orange breasted thrush, Cardinal woodpecker, Heard Wood Owls, Crowned Eagles, Grey Heron, Purple Heron. Other creatures: still a few frogs in the vleis, butterflies, carpenter bees, lots of bees in Halleria lucida trees. 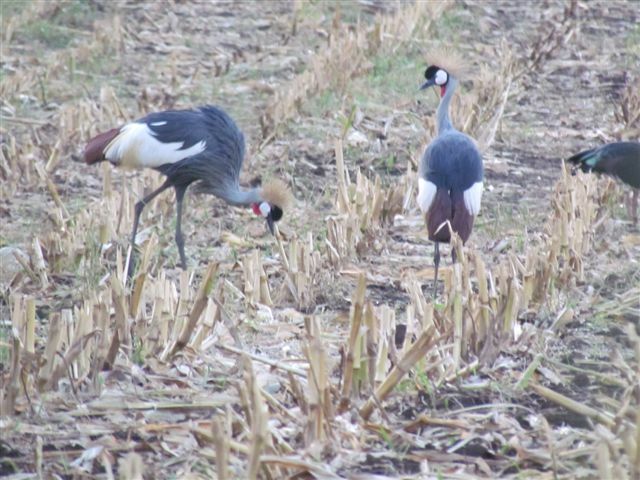 Still see Crowned Cranes daily at the dam. One evening the dogs were barking furiously and I went out to investigate, thinking it would be a porcupine. I was surprised to see it was a caracal – on the other side of the fence, fortunately. 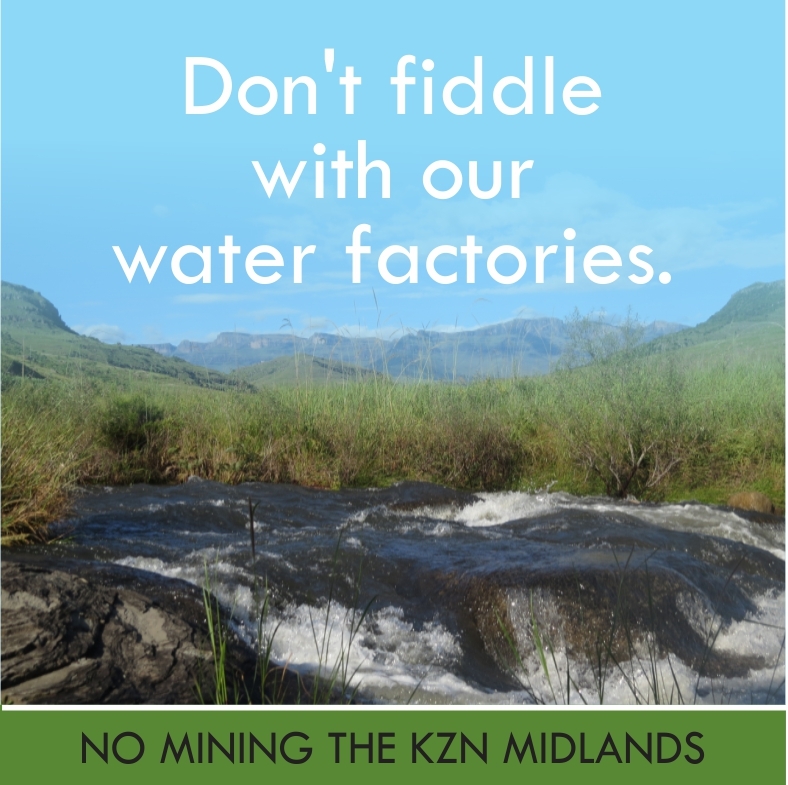 This entry was posted in Uncategorized on June 11, 2013 by Midlands Conservancies Forum. Wonderful! The sights and sounds of Africa! Even better, the sights and sounds of the Midlands. You all took me, in less than five minutes of reading, on a trip, which by car could easily haven taken one three or four days. thank you for sharing your piece of Africa with us tonight, especially the sound effects!